BEFORE: Rolags ready to go. Castlemilk Moorit (undyed) and Norfolk Horn shearling (dyed). Plus some carded wool from Natural Born Dyers! I managed to spin just over 7 miles of yarn in 7 days, with the UK Team, HillTop Cloud. Not a brilliant total – but not bad! The brown is some lovely, prize-winning Castlemilk Moorit (an entire fleece’s worth!) from our sheep at the Yorkshire Museum of Farming. Castlemilk is often short and can be neppy but this was just exquisite (sadly my hurried spinning did it no favours). I didn’t even work too hard at blending the qualities as the entire fleece was not only usable but excellent. Spinning went a bit slower than I’d have hoped, because like an idiot I only gave this fleece a quick cold water wash – it was so clean, I broke the habit of a lifetime and didn’t give it a brutal scouring, before spinning! I often scour to leave a bit of grease in the wool, but this was a bit too much and unless the ambient temperature in the room was good – I wasn’t getting much done, fast! 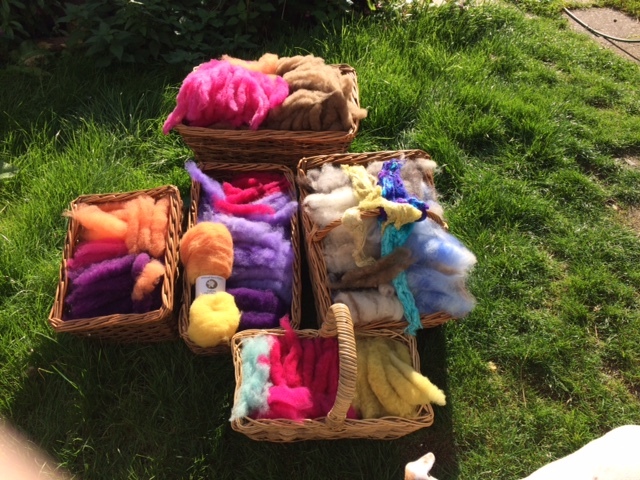 The dyed wool is mainly our Norfolk Horn – a shearling fleece we got this summer (along with a shedload, quite literally, of other Norfolk Horn fleeces!) 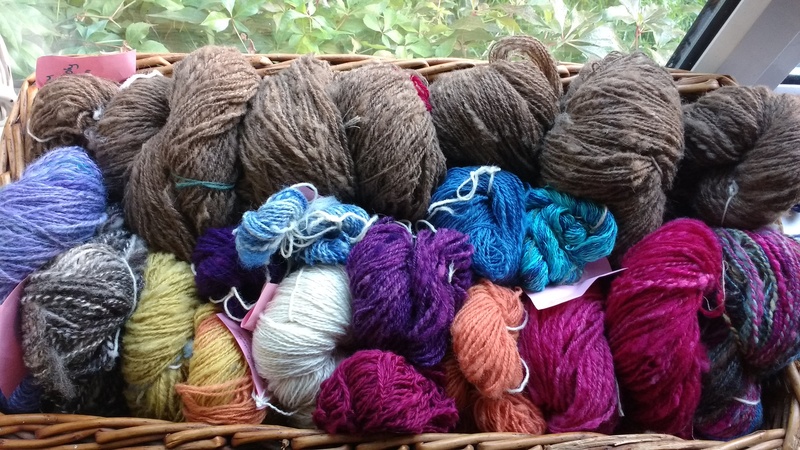 There is some mauve alpaca, blue silk, Eider wool from Natural Born Dyers, and Corriedale from WoolTops. Also a small amount of merino from AdelaideWalker. In the lower layers of the baskets was some Jacobs fleece leftover from the stash of my late friend, Caro. We had used that this year, for our ‘Luddites’ demo-ing, (as she’d have loved us to), so the leftover bits, plied with odds and ends from various bobbins, will make something special for me to look at and smile when I remember her. Sometimes, the wool you spin is bound up with memories – friends you were with when you bought it, places you went, things you were watching whilst spinning… I’ve done a good job of spinning down a 30 year old stash in the past couple of years – to the point that only one thing I spun last week, was from old stash – the mauve alpaca. We bought that a few years ago, on a lovely day out at the Yorkshire Show. 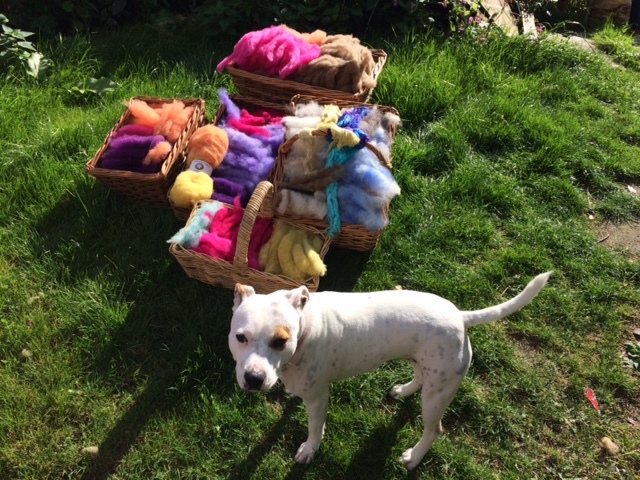 Everything else in the photo is from this year, apart from the Jacob’s and that alpaca. I’ve spun the Castlemilk after my favourite day out this year, at Fountains Abbey when Art Student Son was taking photos and we realised the shots were ruined by the fact I had borrowed his old dog-walking hoodie – so I decided to make myself a ‘hooded monk’, natural coloured, hand-spun hoodie. Watch this space! In terms of ‘experimental archaeology’ – the point for me, being to see how much I could feasibly spin in a day – the answer was, yet again: on a good day – a couple of miles. On a bad day – close to nothing! Spinners in the past had kids, livestock, and all those endless interruptions we call ‘life’, but I have no doubt an 18thC spinner could comfortably double my total, even on a ‘bad’ day. Not a problem in summer, but on a crisp autumn day, wool drafts much more slowly. You need a couple of basic things for good spinning – decent light, and a warm room. These were not universally available to spinners of the past. I was surprised that there was probably very little difference, speed-wise, between spinning woollen and worsted – as I used commercially prepared fibre for the worsted spinning, that just needed a quick bit of pre-drafting. For most of my spinning, I went from rolags, spinning a slubby longdraw. Spinzilla is a great event – bringing together spinners from all over the world. and a reminder that yarn holds so much more than just twist.